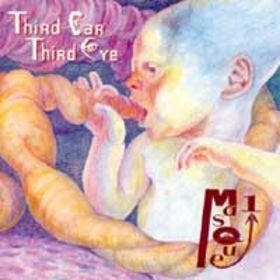 Third Ear/Third Eye is this brazen Japanese quintet's first CD release (following a couple of cassette releases in the late 80s, plus contributions to the Canterbury Edge and Jazz Rock sampler compilations). It can easily be divided into three distinct group sections based on line-up: the Third Ear Side, Third Eye Side, and two bonus tracks. The band occupies a middle ground between Brand X, Gong, and King Crimson. One second they're pounding your head with some gnarly lick, then suddenly switching into to a classy fusion motif. The album's opener "H.T.P." contains an almost sickly odd meter loss within a walking bass line and brash sax leads, which changes after a few bars (and giggles). "Sanchos in Your Head" is an offsetting acoustic piece with sampled female vocal interjections, and whistles in a whimsical mode that fade into a traditional flute melody. These guys definitely have an amusing, anecdotal style to their arrangements. "Shyoku Shyoku" is an improvised piece which could metaphorically be described as Crimson meeting Gong by collision on a freeway marked by no survivors. The Third Eye Side is characterized by a guest female voice (Waiea), followed by five more songs of a similar approach, but less aggressive. The last two pieces date from a previous 1985 session with different personnel. The longest piece is "4383," which is a fade-in ambient, two hammer-on soundscape with alternating leads which evolves into a dissonant group improvisation. The album's closer, "Broken Space," starts with an unsettling backwards tape loop which shuffles between right channel and left. I have to admit I'm impressed by how well this all fits together, considering time delays and musician interchangeability. Although the cover art is offensive, don't flinch at a chance to find a clear choice from this notable band and label.